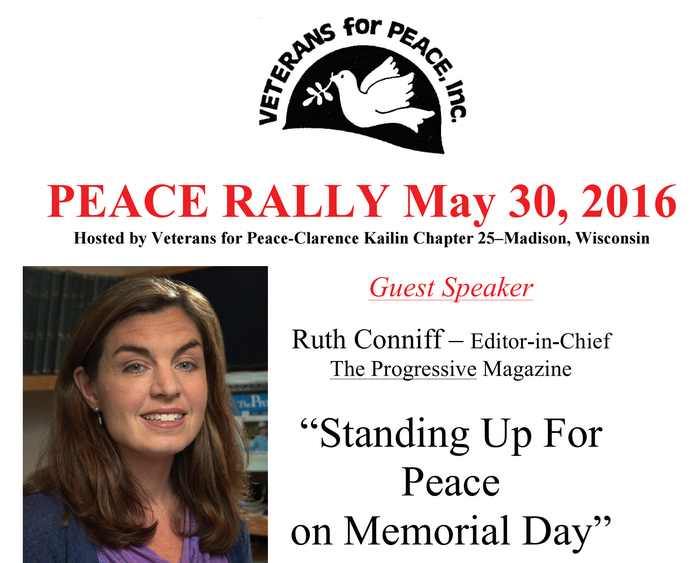 Momentous changes resulting from U.S. hegemony in the world will be described during this May 28 peace rally – sponsored by Chapter 25 Veterans For Peace in Madison. The program at Gates of Heaven will include an invocation by priest, former Madison police chief, and Veterans For Peace (VFP) member David Couper. Student scholarship winners will be noted, the band Old Cool will perform, and Progressive magazine publisher Norman Stockwell will describe a recent visit to Viet Nam. Bagpipe dirges by Sean Michael Dargan will end the Peace Rally program. 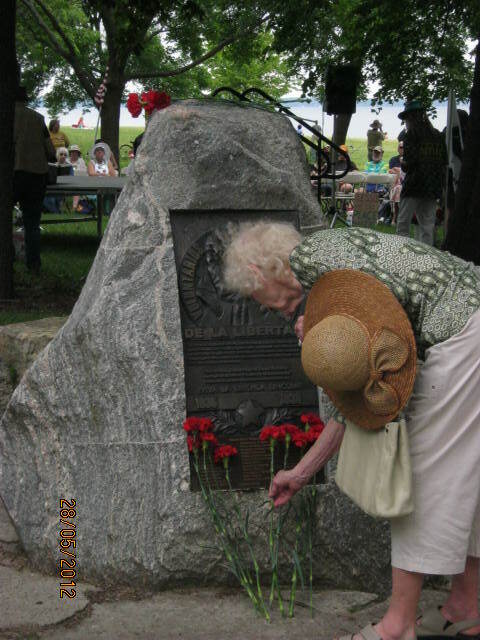 Audience members will receive red carnations to place at the nearby Abraham Lincoln Brigade marker in James Madison Park. 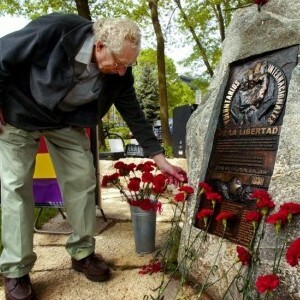 Veterans for Peace Chapter 25 namesake Clarence Kailin was a volunteer in the Lincoln Brigade fighting fascism in 1937 during the Spanish Civil War. Additionally, Veterans For Peace Chapter 25 will be setting up over 6000 tombstone replicas (The Memorial Mile) at Olbrich Park for Memorial Day weekend to remember those who have died in in the wars in Iraq and Afghanistan. The display will be set up on May 26th and taken down on June 2nd. This entry was posted in Clarence Kailin Chapter 25, Memorial Mile and tagged Alfred McCoy, Memorial Day, Memorial Mile, VFP on May 15, 2018 by Website Administrator. On Memorial Day this year, I spoke at a rally organized by the Clarence Kailin chapter of the Veterans for Peace in Madison, Wisconsin. It’s like an annual family gathering for progressives in Madison. Particularly sweet for me, the event was held at the tiny, historic Gates of Heaven Synagogue, where I was married on a summer day almost 17 years ago. The day before the event, I asked my dad what he thought I should say. Being a visual artist, his answer was to take me down to Olbrich Park to drive the Vets for Peace Memorial Mile. Every year, veterans set up small white tomb stones along the edge of the park, in memory of the more than 6,675 U.S. soldiers who have lost their lives in Iraq and Afghanistan since 2001. It’s a powerful statement, that annual display, there in the heart of a peaceful weekend scene. As you drive past, the gravestones flow by in long, silent rows, past the tennis and basketball courts, past kids playing and joggers trotting past, with the dome of the state Capitol shining across the lake. They are a reminder of the terrible price of the wars being fought in our name, far away from our everyday lives. My dad and I drove to the end of the park, turned around in a parking lot and drove back past those 6,675 tomb stones. It was raining on and off, and the sun was bursting through the clouds, intermittently lighting up the raindrops on our windshield./ We had just reached the top of the hill at end of the park when a big rainbow appeared in the sky, stretching from horizon to horizon, framing those glowing grave markers in the park below. And then we drove home. Zinn, who flew bombing missions over Europe as a World War II pilot, was invited to participate in a panel of veterans telling “war stories” to dedicate the World War II memorial in Washington, DC, back in 2004. He startled his audience, he wrote in The Progressive, by declaring: “World War II is not simply and purely a ‘good war.’ It was accompanied by too many atrocities on our side.” One of those atrocities—the atomic bomb the United States dropped on Hiroshima—was in the news this week, as President Obama became the first sitting President to visit the bombing site. Obama called for “a world without nuclear weapons,” and honored those who died. There was a lot of political debate about whether the President would apologize to the people of Japan (he did not). His visit reignited debate about whether the atomic bomb was “necessary” to end the war (we have published a fair amount of scholarship showing that it was not). But here again, words are inadequate. That moment stayed with me for years and years afterwards. I remember the eager freshmen around me—mostly boys—dutifully raising their hands and jumping into the debate. I don’t remember much about which positions they chose. What I do remember is the feeling that this was not so much a college course in history as it was a training session in absolutely stunning hubris. That “quick show of hands” method of thinking about war may be precisely the kind of training you need to be a future leader of a military superpower waging war around the globe. If you are too overwhelmed by the horror of war to engage in a “quick show of hands” debate, you can begin to feel quite alienated. That’s why I am glad to work at The Progressive, where, for the last 107 years, we have failed to raise our hands to support U.S. military aggression. We’ve published Howard Zinn and Erwin Knoll and Kathy Kelly and other voices of reason and humanity that stand up to the macho nonsense and mechanistic, dehumanizing rhetoric of war. I had a chance to talk to Phil Straus, of the Straus Military Reform Project, after the Pentagon made its 2017 budget request: $582.7 billion in discretionary funding—a $2.4 billion increase over last year. $58.8 billion of that is for a general “war spending” slush fund created to finance the wars in Iraq and Afghanistan in 2001. It’s not subject to spending caps or regular scrutiny by Congress. Straus and his colleagues have been fighting for years just to get the Pentagon to submit to regular audits. Years ago they helped uncover the fact that more than $8.5 trillion doled out by Congress to the Pentagon since 1996 can’t be accounted for at all. We don’t even know how the money was spent. Our military budget is a statement of seriously warped national priorities. Straus calls the latest budget a “Mardis Gras” for defense contractors. We don’t just spend ten times more than China, the next largest military power, we are burning the money on weapons that don’t work, some of it on we don’t even know what. Like the $300 million a year in unaccounted for spending on the national police in Afghanistan. That’s pretty troubling given our problems at home. Think Progress points out that with 1 percent of the military budget, we could purchase permanent housing for the nation’s 565,000 homeless. In fact, the Pentagon could make every homeless person in the United States a millionaire and still have money left over. I was on a local radio show last week, when a woman called in to explain why she supports Bernie Sanders, and why she is completely disaffected from mainstream politics in this country. She talked about multinational corporations outsourcing jobs, and domestic and foreign policies that are making things worse for the people who live in her neighborhood. She described how one young man who lives nearby came back from Iraq with no face.She was stringing together these ideas—that our government serves the powerful and corporations, and that shrinking opportunity at home is related to our military adventurism abroad—and I could see the host and the conservative guest in the studio with me getting visibly impatient. The way this woman was describing America is not at all the way our political leaders or TV pundits describe it. It’s not our shared language, it’s complicated, and it’s a downer. My conservative counterpart, when he finally got to respond, called it “incoherent.” But it wasn’t incoherent. In this political year the sense of anger and betrayal in that woman’s voice is something many Americans are feeling. You can feel like you are crazy and isolated thinking that way. Especially when it comes to far away wars, it’s much easier not to feel the heaviness of moral responsibility. Also, we are trained not to think about it, to push it aside, to rationalize warfare as somehow making sense, when the lived experience of it cannot be justified or made sense of. Quick show of hands: Who would drop the bomb? The level of sheer callowness we have to cultivate to keep living this way is breathtaking. I am grateful to be part of a progressive community that stands for peace, and that can create a response to war as moving and serious, and also beautiful, as that Memorial Mile on Lake Monona. I’m thankful for a Memorial Day tradition of gathering together to support each other in our work to bring our community and our country a little more sanity, humility, and peace. This entry was posted in Hiroshima, Memorial Mile and tagged Hiroshima, Memorial Day, Memorial Mile, Ruth Conniff, The Progressive Magazin on June 2, 2016 by Website Administrator. Click on image for full poster. This entry was posted in Madison Area Technical College Scholarship, Madison College Scholarship, Memorial Mile and tagged Clarence Kailin, Memorial Day, Peace Rally, Ruth Conniff on April 21, 2016 by Website Administrator.